Declaration, for Noble Peace prize for this year since yesterday, has elated spirits of many all over the world. People will at large sigh with a sense of relief. 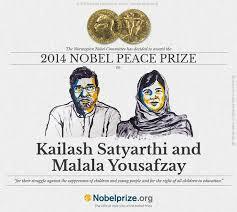 The wise choice of the peace award committee of the Noble prize deserves all kudos. The two political enemies nations can expect good days to come. It is a remarkable combination of awarding the prize for two people of different nationalities ( India and Pakistan) and faiths (Hindu and Muslim) together to pool resources to bring relief to the world at large. Both have struggled to bring justice to oppressed children and young people in their noteworthy way. We can see the light at the end of the tunnel. It is a struggle to bring education and fight extremism, for the children, especially for the girl child. Alfred Noble had willed to do this good work of bringing fraternity between the nations of the world. She has fought for years to bring education to the girl child in Pakistan. She got shot in her head and luckily survived and got transferred to the UK. She has been issuing statements that empower the girls formal education. At the age of 12, she wrote, ” An anonymous diary for BBC Urdu” about the life the Taliban enforced on the populace of Northwest Pakistan. She was well-known in the world press as she got to address the UNO. Satyarthi has been working very long since 1980 for freeing the children from bonded labour in India and other parts of the world. He worked with full dedication involving his wife for “Save the Childhood Movement,”. He has freed over 80000 children under oppressive conditions with no hope for any education. His children were brought up under the same roof with children freed from the bonded labour and oppressive conditions. Both kids have joined with the parents to go to fight against oppression and rights of children. He is humble to deal with the world. He achieved success, towing the line of Mahatma Gandhi to go on fighting peacefully against the odds. Much will be done under these two stalwarts and bring solace to people of the world not forgetting the two different nations of India and Pakistan and denominations.